“Body positivity” has become a buzzword concept of late. Even though the idea may be new to many, the movement grew out of the fat-acceptance movement of the late 60s. Today, influencers and brands are jumping on the body-positive bandwagon in hopes of capitalizing on the trend. The core message of body positivity is that all people, but particularly people in marginalized bodies, have the right to exist peacefully and be treated with respect, regardless of their body’s size, shape, color, or ability. It’s true that smaller women experience body policing and shaming (e.g., being asked if they have an eating disorder) and that arguably all women are negatively impacted by society’s unrealistic beauty standards. But it’s important to remember that body prejudice exists on a spectrum. Women in larger bodies experience systemic discrimination for their size that affects every facet of their lives — from employment, to representation in the media, to access to clothing. On the other hand, thin women and “straight-sized” women (those who wear clothing sizes that aren’t considered plus-size), either don’t have to worry about discrimination for their size, or deal with it to a lesser extent. As a thin coach, I have heard from other coaches in the industry that they’re unsure of how they fit into the body positivity landscape because they haven’t experienced the type of widespread discrimination that burdens women in larger bodies. These coaches are often uncertain what role they should play, if any, in the movement to make sure that all bodies are treated equally. For coaches who enjoy the benefit of thin privilege, it’s more important than ever to be a size-friendly coach. A size-friendly coach treats all of their clients with the same respect and dignity, regardless of their size, and attends to the unique needs of their clients of different sizes. Being aware of your thin privilege will allow you to serve as an ally to your clients in marginalized bodies and stand up to the oppression they face. What steps can you take as a coach to ensure you’re being size-friendly? 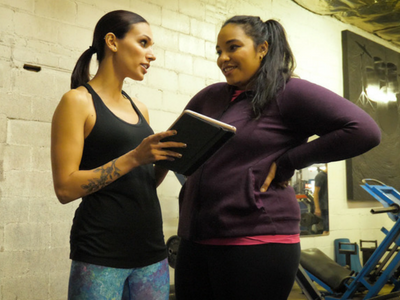 If you’ve never thought much about how your actions as a coach may affect your clients in larger bodies, here are some specific steps you can take to make sure that you’re being as size-friendly as possible. Get to know your clients as individuals, and don’t make assumptions about their abilities based on their size. 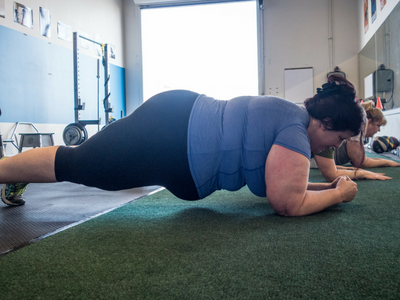 I have heard countless stories from women in larger bodies about coaches who made incorrect assumptions about their athletic abilities based solely on their body size. Coaches commonly operate on the belief that women in larger bodies are either exercise beginners or deconditioned. You can’t tell anything about a person’s exercise history or strength just by looking at them. This is true for clients in both smaller and larger bodies. For all you know, your thin and toned client hasn’t exercised in years, while your client in a larger body is a competitive trail runner. That’s why you should always complete a thorough intake and assessment to learn about a new client’s individual exercise history, limitations, and ability levels. Once you understand your client’s background, make sure that you choose appropriate exercises. Certain exercises that you instruct your smaller clients to perform may be uncomfortable for some of your larger clients from a biomechanics standpoint. On the other hand, don’t automatically assume that clients in larger bodies can’t handle a challenge. Programming for clients should be a collaborative process, so frequently check in with your clients about discomfort, level of difficulty, and level of enjoyment. The health and fitness industry tells men to get strong and women to lose weight. The pressure to lose weight is even greater on women in larger bodies, and many coaches contribute to this problem. One of my past coaching clients told me that she asked a previous trainer not to prioritize weight loss with her, but he ignored her request and only focused on how she could lose weight. As coaches, we have to stop assuming that weight loss should be a woman’s goal. It is inappropriate for coaches to push weight loss on clients who have not asked for it, no matter what that client’s size is. That also means not forcing clients to do weigh-ins, take measurements, or save progress photos. Our clients have the right to make the choices that feel best for them. Familiarize yourself with the concepts of Health at Every Size, and remember that your clients can be working on health-promoting behaviors irrespective of their size or weight. 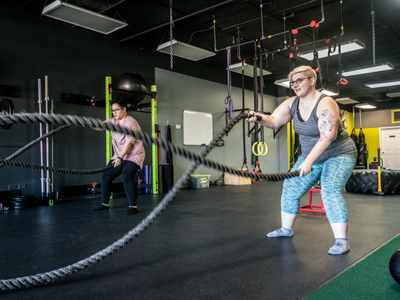 There are a variety of non-aesthetic goals that we can help clients achieve, such as getting stronger or faster, improving their relationship with food, or achieving an unassisted pull-up. When a coach gets fixated on a client’s size or the number on the scale, it tells the client that the way their body looks is their most valuable trait. Even when a client comes to you for the purpose of weight loss, try to get to the real reason behind their desire. Do they want to have more energy to play with their kids? Are they hoping to improve their heart health so they can live longer? Many clients want to lose weight because they’ve been led to believe that weight loss is the only solution to a variety of problems, but their underlying goals can often be achieved without needing to lose a certain amount of weight. If you coach clients in person, make sure that your space is comfortable and welcoming for clients of different sizes. Thin and straight-sized coaches often overlook the ways in which the world has been designed for smaller bodies, and this extends to the health and fitness industry. It is important to assess your space to make sure that it’s easy to navigate for bodies of all sizes. Do you have comfortable chairs without arms that have higher weight limits? Do you have equipment available in a variety of sizes? Are pieces of equipment so close together that clients in larger bodies will have trouble accessing them? Are you aware of the weight limits on your equipment? These are all questions you should ask yourself when determining if your space is size-friendly. Be aware that many women in larger bodies have had bad experiences with fitness culture and gyms. Don’t be afraid to ask your clients about their past experiences with fitness and find out if there’s anything you can do to make them feel more comfortable or welcome in your space. Be thoughtful about the language you use to make sure you’re not putting bodies in a hierarchy. A lot of the common language that coaches use is steeped in fatphobia and the erroneous belief that having a thin body is better or healthier. In order to be a size-friendly coach, you need to be aware of your language and how it might be interpreted by others. First, be considerate of how you speak about your own body in front of clients and on social media. Avoid making comments about “feeling fat” or describing why you don’t like certain parts of your body as that will invite body comparisons between you and your clients. I’m certainly not asking you to lie about loving or accepting your body if you’re not there yet, but you should aim to model a positive relationship with your body — one that is based in gratitude and how your body is deserving of respect no matter what it looks like. Second, don’t make comments about your clients’ bodies, not even things that you perceive as compliments. Compliments can be a great way to encourage and support your clients, but they should be based on a client’s non-physical traits, such as their performance, hard work, or dedication. Complimenting your client’s weight loss could accidentally reinforce the idea that thinner is preferable and imply to them that you think they look better now than they did before. Even a seemingly innocuous “You look so great!” in reference to your client’s body changing could be very triggering. Lastly, nix “motivational” language that is steeped in fat shaming from your fitness vocabulary. It is rare to attend a fitness class or a personal training session and not hear the instructor or coach talking about burning off calories or meals, how bikini season is coming up, or how a certain exercise will blast fat or create “long and lean” muscles. These kinds of statements miss the mark and assume that the only reason women are exercising is to lose weight or change their body shape, which can be very off-putting for clients. As women, we are taught from a young age that our appearance is our most important quality. Coaches should work to disrupt that paradigm, not feed into it. Our bodies are no one’s business but our own. If you’re a thin or straight-sized coach, use your thin privilege to create space and advocate for those with larger bodies. That’s why it’s crucial that we take care not to center our own voices in the conversation. Instead, we can use our platforms to elevate and amplify the voices, experiences, and work of those who are living in marginalized bodes. If you do the things on this list, you will be well on your way to becoming a more size-friendly coach. The best way to make sure you’re being size-friendly remains to listen to and learn from people living in larger bodies. Follow them on social media. Read their work. Purchase the books and courses they create. Also, understand that even if you are the most size-friendly coach in the world, some clients in larger bodies will feel most comfortable hiring a coach who looks more like them, and that’s OK.
Every person deserves the opportunity to develop a healthy relationship with exercise and food, regardless of their size. While the health and fitness industry has notoriously been unfriendly to people in larger bodies, you can be a part of making this industry more inclusive and body-positive for everyone.